Having removed the magneto and with replacing the drive dog on it with the POC’s uprated version I needed to retime the ignition. 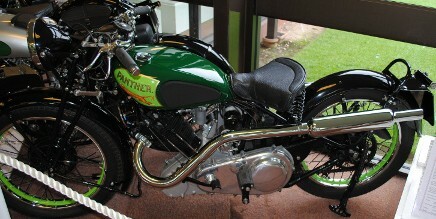 On a Panther there are no external timing marks and the ignition point is normally quoted as with the magneto set on full advance at a set distance before TDC,‭ ‬measured with a rod down the spark plug hole in the head. An option is to set it to TDC with the magneto on full retard,‭ ‬determined the same way.‭ ‬This sounds easy but it is in fact not so simple or accurate to determine because there is an appreciable amount of crankshaft rotation at TDC with minimal piston motion and it is easy to be a fair bit out. I decided to make up a special tool for this. The obvious way is just to take an old plug,‭ ‬smash out the ceramic and use a rod going down through it. Downside with this is that the rod is going into the cylinder at an angle so that any distance measured on it will not be an accurate measure of piston movement,‭ ‬not only that but because it is at an angle it can jam the piston rather than being pushed up by it and cause damage. 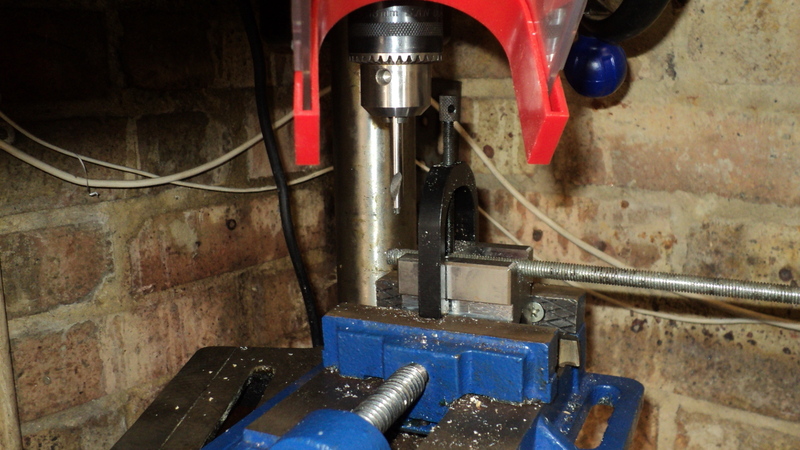 I’ve a spare cylinder head and using this I found that not only could an old spoke go down the plug hole vertically when angled across it but there was a flat horizontal face on the outside of the head at the plug hole to set the tool on and also act as an index point. So I took a piece of‭ ‬2.0mm flat aluminium sheet scrap and cut it to fit across this flat area. I then drilled a‭ ‬5/16inch‭ (‬8mm for the metrically inclined‭) ‬hole in the plate,‭ ‬centred on the plug hole and filed the bottom edge of the plate below that to a chisel edge. As I wanted to keep the spoke vertical I scribed a line up through the hole centre and using the corner of a hand file I cut a‭ “‬V‭” ‬groove on it. The spoke will be pulled into this groove and so locked at‭ ‬90°‭ ‬to the edge of the plate. Next I took a length of studding and then drilled across it’s diameter close to the end,‭ ‬the drilling being just clearance for a spoke and an inch length cut off the studding. 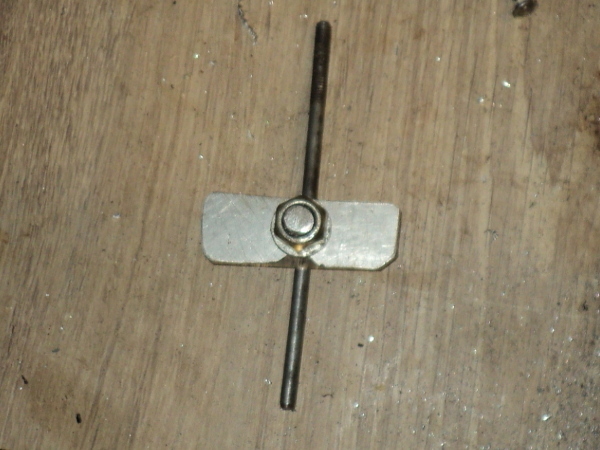 The spoke was then put through the hole,‭ ‬the cut studding put through the plate so that the chisel edge was against the spoke and a nut and washer fitted so that while the spoke was held against the plate it could still be pushed up and down through the bolt. The plate was then put in place on the cylinder head with the spoke going down the plughole and the bottom edge of the plate was held firmly down onto the flat face above the plug hole. 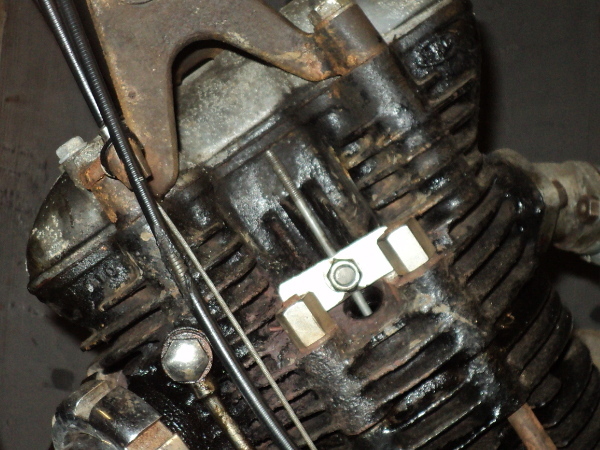 The motor was then gently turned over and as the piston rose up the bore it pushed the spoke up through the bolt. 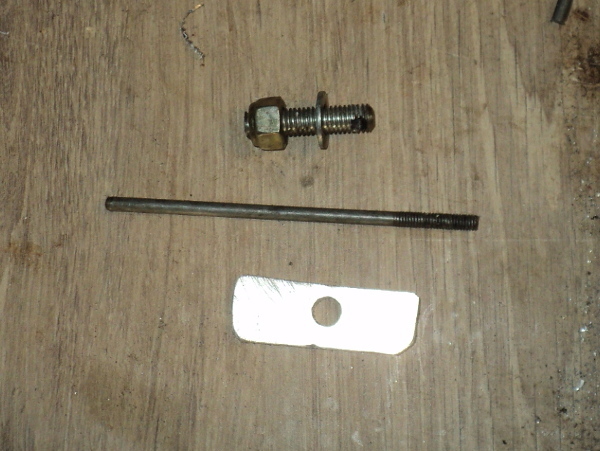 Since the bolt had been tightened enough to hold the spoke but not enough lock it in position,‭ ‬as the‭ ‬piston went across TDC and back down the bore on the other side,‭ ‬the spoke was left at the TDC position. The device was removed from the head and a mark was put on the spoke at the chisel edge. Reference was made to the bikes manual in the POC websites‭ “‬Library‭” ‬to find the correct advance distance for my motor,‭ ‬45°‭ ‬or‭ ‬19/32‭”‬,‭ ‬and another mark made on the spoke at that distance above the TDC mark. 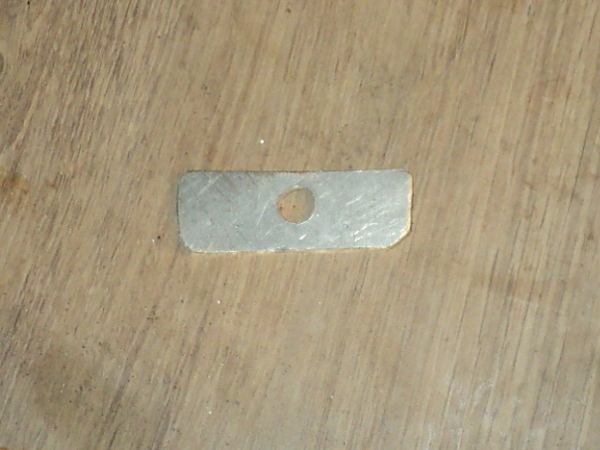 This mark was aligned against the chisel edge on the plate and the nut tightened down to lock the spoke in place. 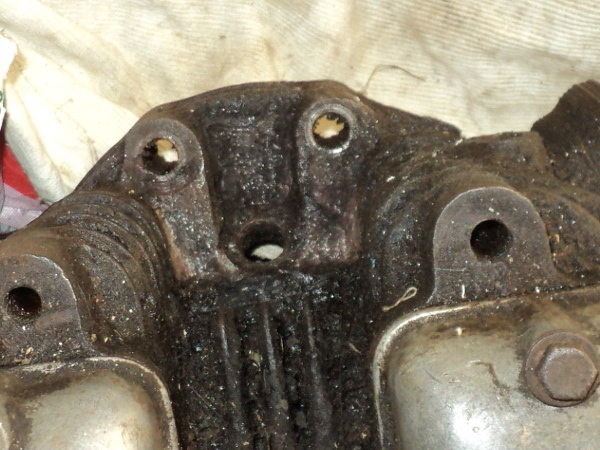 The motor was now brought to TDC on the compression stroke and then turned backwards to take the piston back down the bore to before the ignition point,‭ ‬the new tool put in place with the spoke end down through the plug hole and the motor gently turned forwards until the piston was felt to touch against the end of the spoke. The motor was now at the correct spot to set the magneto timing at full advance so the Magneto could now be set in place and its timing set. This is a bit more sophisticated than the old idea of using a‭ “‬pencil down the plug-hole‭” ‬but it’s easier to use when set up,‭ ‬it has a clearer index point AND there’s no chance of losing it down the plug-hole. This new tool is small enough to keep in the tool-set carried on the bike itself, I’ve got an old tobacco‭ tin with the tappet spanners, push-rod tube spanner, mag spanners, a set of feelers, a packet of cigarette papers and now this tool kept in the toolbox, ‬after all,‭ ‬if you have it with you then you won’t need it but if you haven’t got it you will‭! This entry was posted in Panther on February 1, 2016 by Drew.